It’s hard to imagine a screwier and easier to criticize step on the way to pick a presidential nominee than the Republican quadrennial exercise in mobilization, purchased votes, and kitsch that is the Ames Straw Poll, in which candidates compete for the bragging rights for an event that will draw fewer than 15 thousand voters and has no formal relationship to actual delegate selection. And yet, the results are undoubtedly important. Most Iowa observers believe that Mike Huckabee’s second place finish at Ames in August 2007 was a major step towards his victory in the state caucuses five months later. Other candidates, including, most notably, former Vice President Dan Quayle in 1999, have dropped out after failing there. So while the Straw Poll certainly doesn’t determine the nominee, it is clearly a significant influence. Can this amount of clout possibly be justified? Yes, it can—though believing so depends on a proper understanding of the purpose of the event. 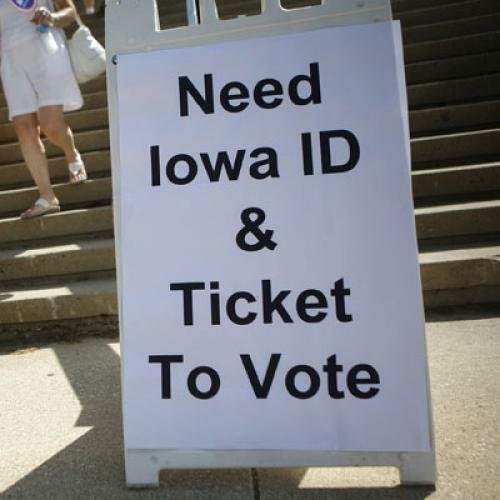 The key to grasping the place of Ames in the Republican nomination process is that it occurs right in the middle of the invisible primary—that portion of the process that takes place before voters are involved. During this period, candidates aren’t seeking the support of rank-and-file Republicans; they are appealing to party insiders of various kinds: party-aligned interest groups and media; governing and campaign professionals; formal party officials; and activists. From the point of view of those actors, the invisible primary is a time to sort out conflicts and coordinate action. But that creates a problem. This stage of the process acquired the nickname “invisible” for a reason, as the events within it are, well, not very visible. If our political parties were small, or hierarchically organized, then coordination would be easy. But parties in the United States aren’t like that at all; they are sprawling, complex organizations that include local and national networks, as well as formal party organizations that are only loosely affiliated with each other. So, if you’re a part of that vast network and want information about the candidates—which ones are acceptable to others who agree with you, for instance, or which ones have a chance to win—then it’s not always easy to figure out exactly what you need to know. Evidence from political scientists shows that party actors use high-profile endorsements as part of that sorting process. They likely also use any other indicator they can find, but most of them are flawed. Early polling is often more about name recognition than about how voters will treat candidates once they know them. Fundraising totals can be meaningful indicators of party support, but can also be boosted by purely personal loyalty. In other words, party actors are grasping at straws. That’s how we get absurdities such as the infamous “Shrum primary” from the 2004 Democratic cycle, when news about which candidate longtime consultant Bob Shrum would favor with his talents became a major story. It’s not that everyone thought that Shrum was all that important to the candidates; it’s that everyone thought that Shrum was so well plugged-in that his choice would reflect good judgment about who was going to win. So while Ames is ridiculous, it’s not nearly as ridiculous as the Shrum primary. In fact, seen as a source of information for party actors, it has a lot going for it. Ames provides evidence, no matter how imprecise, of two things: activist interest in the candidates, and the ability of candidates to run a competent campaign. Both are of interest to party actors, and they should be. For example, say that you’re a mainstream Republican donor who is choosing among nearly a dozen candidates. You don’t want to waste your time and effort supporting someone who doesn’t have a chance. But how do you know what to think about, say, Tim Pawlenty? You know that his positions on issues appear to be acceptable to most Republicans, and he would appear to be more electable than many of the contenders, but you also know that he’s not raising all that much money and that he’s barely above an asterisk in the polls, so you suspect there’s something wrong. Well, here’s an opportunity to gather some clues. If Pawlenty manages to perform well at the straw poll, you have some new evidence that he’s capable, at the very least, of inspiring support from activists, and that his campaign operation is competent enough to capitalize on that support. If, on the other hand, he flames out in Ames, it wouldn’t prove that he couldn’t do well in the primaries and caucuses, but it would be yet another hint that his popularity just isn’t going to catch on. Of course, those party actors looking for signs in the straw poll are free to treat that information however they want, including totally ignoring it, and they would do well to remember that extrapolating from any single event is risky. But when information is needed, but scarce, more is better than nothing. So don’t think of the Ames Straw Poll as an election; think of it as a means of generating information for party actors. And that’s a function which it can perform reasonably well.